Home / Guest Blogger / Freedom to participate: can the capability approach offer insight into participation in disaster recovery processes? After a disaster, do people always have the capabilities to participate fully in the reconstruction and recovery process? In the development and humanitarian fields, we know that participation by people affected by disasters is key to achieving positive and sustainable outcomes, from houses that use materials local people know how to maintain, to more effective community planning that strengthens future resilience. As Victoria’s post nicely described, there are several levels of participation in reconstruction, from token consultation to citizen control. While I think that a situation where citizen control of recovery processes is the goal, I also think we need to ask whether and when citizens have the capabilities to exercise this control. I find the capability approach is useful for digging deeper into how citizens can reach this ideal form of participation and for addressing the underlying factors that can prevent them from doing so. By focusing on individuals’ and communities’ freedoms to participate meaningfully in the recovery process we can ask, what are people able to do? Can they rebuild their own houses (their traditional construction knowledge and skills enhancing this capability) or do they have access to loans in order to hire their preferred builder? Do they have the capability of holding their government accountable for delivering particular services? Does engaging in these activities advance the interests of the survivors in a way that they see as valuable to their well-being? Asking what freedoms people and communities have to participate also uncovers their un-freedoms. Does poverty or illness prevent them from participating? Does identity disadvantage a certain group of people in making claims on government and social organisations? I think asking questions such as these reveals the space in which citizens in a particular context are able to engage in and take control over the recovery process. These questions are not so different from questions on the underlying causes of vulnerability. Yet the critical point is that people need to be free and unfettered from taking part in reconstruction, and they must see the value of doing so in order to be motivated to participate. For humanitarian organisations, it is worth investigating how their programmes help widen the space where disaster survivors can operate. This could entail recalibrating the support to fit the survivors’ notions of well-being. Are the organisation’s outputs (such as house materials provided or the adopted strategy to engage people in the rebuilding process) conducive to achieving outcomes that meet diverse definitions of a successful recovery? And, through their interventions, do organisations enhance capabilities that are key for attaining other valued “beings and doings” such as the freedom of expression or to plan for the future? This post attempts to introduce thinking about disaster responses in terms of capabilities of the survivors. Following posts will further explore the “capability to design” and measuring capabilities as outputs and outcomes. Julia is a recent graduate from the Development Planning Unit’s MSc Building and Urban Design in Development. She wrote her dissertation on applying the Capability Approach to city-building processes in informal settlements. Prior to attending the DPU, Julia worked with self-financing schools in Tanzania and completed her BA in Urban Studies and French at the University of Pennsylvania. 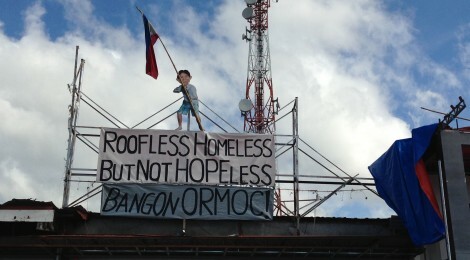 Many thanks to Wan S. Sophonpanich for the photo of Ormoc City 20 days after Typhoon Haiyan. Follow Wan on instagram here. [i] For an overview of the capability approach, see Robeyns, 2005 and for a list of central capabilities, see Nussbaum, 2003.